Paratha is the best Indian breakfast. Cabbage paratha is another very crispy and crunchy one which is very delicious as well. 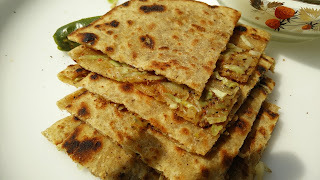 This paratha is very easy to make like other parathas. 1. Mix the cabbage with all the spices for the stuffing. 2. Make 2 dough rolls and flatten them up. Place the stuffing on one of the roti and put other one on it. Gently roll both the rotis together and using dry wheat flour, roll out the paratha. 3. Place the paratha on a hot griddle and shallow fry using oil till crisp from both the sides. Serve hot with curd and pickle.